Remember OLED? Even back in 2009 we were lamenting how the gorgeous screen tech seemed to be a flash in the pan for televisions—at least for those with less income than Lex Luthor. LG, however, is OLED-ready. 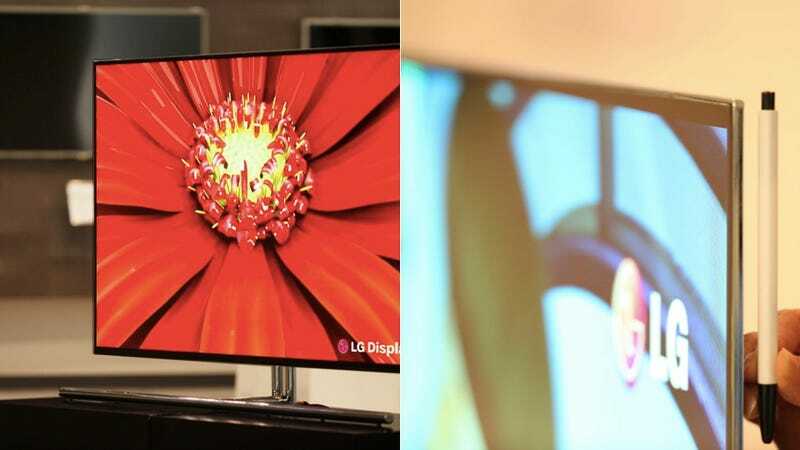 The company says part of its 2012 CES showing will including a whopping 55-inch OLED display, meaning bright, beautiful, sharp, and huge—to a degree beyond any TV out today. And because the OLED sets generate their own light (as opposed to an LCD TV that requires a backlight), the panel is only 5mm thin. That's very thin. We'll have our eyes-on impressions for you at CES so so soon, but until then, a little sobering perspective: OLED is still a nascent technology for tubes, which means it's going to be as expensive as it is pretty—when LG sold a 15-inch set, it was $3,000. And that "world's largest" claim will ring true only if another company doesn't show off an OLED TV that's... larger. Either way, my eyeballs are eager.